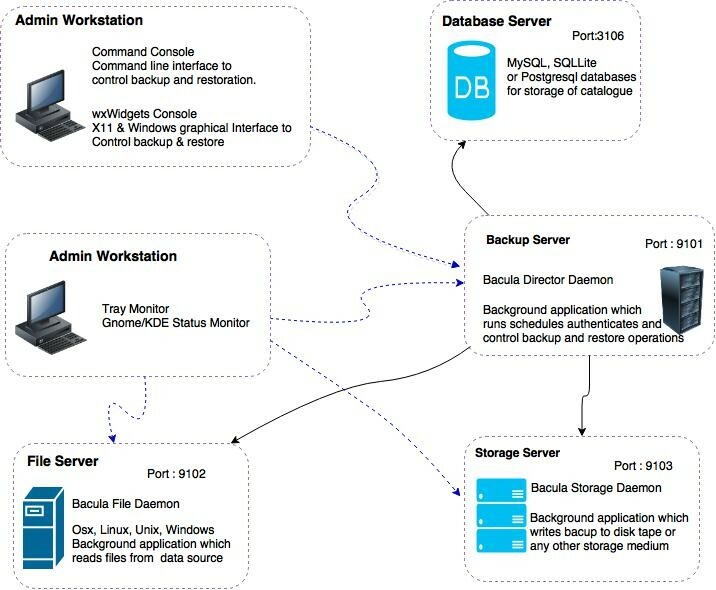 Bacula is a software which permits the system administrator to manage backup, recovery, and verification of computer data across a network of computers of different kinds. The majority of the source code of Bacula is released under the GNU General Public License version 2. Bacula can run entirely upon a single computer and can backup to various types of media, including tape and disk. Why and Who Needs Bacula? If you are currently using a program such as tar,zip or dump to backup your computer data, and you would like a network solution, more flexibility, or catalog services, Bacula will most likely provide the additional features you want. Since it is a sophisticated backup package, the Bacula project does not recommend using Bacula for newbies and those only need to perform basic backup tasks. Software that controls the backup and restore operations that are performed by the File and Storage daemons. It supervises all the backup, restore, verify and archive operations. The system administrator uses the Bacula Director to schedule backups and to recover files. The Director runs as a daemon (or service) in the background. Software that performs reads and writes on the storage devices used for backups. The Bacula Console service is the program that allows the administrator or user to communicate with the Bacula Director Currently, the Bacula Console is available in three versions: text-based console interface, QT-based interface, and a wxWidgets graphical interface. The first and simplest is to run the Console program in a shell window (i.e. TTY interface). Most system administrators will find this completely adequate. The second version is a GNOME GUI interface that is far from complete, but quite functional as it has most the capabilities of the shell Console. The third version is a wxWidgets GUI with an interactive file restore. It also has most of the capabilities of the shell console, allows command completion with tabulation, and gives you instant help about the command you are typing. The DB server manages catalog services. Which are comprised of the software programs responsible for maintaining the file indexes and volume databases for all files backed up. The Catalog services permit the system administrator or user to quickly locate and restore any desired file. The Catalog services sets Bacula apart from simple backup programs like tar and bru, because the catalog maintains a record of all Volumes used, all Jobs run, and all Files saved, permitting efficient restoration and Volume management. Bacula currently supports three different databases, MySQL, PostgreSQL, and SQLite, one of which must be chosen when building Bacula. The File daemon is a program that runs on each (Client) machine. At the request of the Director, finds the files to be backed up and sends them (their data) to the Storage daemon. We have to specify the following things in the file daemon configuration. • Client – to define what Clients are to be backed up. • Director – to define the Director’s name and its access password. • Messages – to define where error and information messages are to be sent. For the installtion of Bacula you will need two machines. I done all this on ubuntu 12.04. So please make necessary changes if you are using a RHEL based distribution. I set the hostname of my server as BackupServer and the client machine’s host name is ClientMachine. Change these values to what you are using. You can add respective hosts entries for a better communication across both. If you don’t have proper DNS for the domains it is a mandatory thing. No local backups will be stored on the remote client machine, so not all of the bacula components need to be installed. We need to modify few items and save some information that we will need for our server configuration. Begin by finding the Director section. The bacula director is located on the backup server. Change the “Name” parameter to the hostname of your backup server followed by “-dir”. Password = "QVw6rZpQkdbJRdkGWOG7luJhn-vu83cG"  # Copy this password for later reference! We also need to configure this daemon to pass its log messages to the backup cloud server. Find the Messages section and change the “director” parameter to match your backup cloud server’s name. The client machine is now correctly configured. The client machine is now configured correctly. Next, we will configure the backup cloud server to pull the file data from the client. The major configuration are actually done on the backup server. That is because the bacula “director” manages all other bacula processes and must be able to communicate correctly with a number of different components. Now that we have identified the first job as backing up on the local machine, we want to create a similar job for backup up our remote client. To do this, copy and paste the job definition below the one you just modified. Next, define a place for the remote backups to restore. We will use the directory that we created on the client machine to restore remote backups. Find the Client definition. We will change the “Address” parameter to reflect our actual backup cloud server IP address instead of using localhost. The password should already be set correctly for the local machine. The next step is to actually define the client machine that we’ve been referencing in our configuration. Copy the Client entry we just modified paste it below the current definition. This new definition will be for the remote machine that we are backing up. Match the name to your client machine’s hostname followed by “-fd”. The “Address” line needs to match the client machine’s IP address or domain name as well. Finally, this is where you enter the password that you copied from the remote client’s file daemon configuration file. Make sure that you modify this password value, or else bacula will not function correctly. Find the Pool definitions section. We will first add a parameter to the “File” pool definition. Add the “Label Format” parameter to the definition and choose a prefix to name local file backups. For this guide, local backups will have “Local-” as a prefix. Next, we need to copy the section we just modified and paste it below the current entry. This will be set up for remote backup storage. Log into the bacula console to test the backup functionality. It should return a summary with some statistics, confirming that we can connect to the remote file daemon. The director will send the backup task to the remote file daemon and which will pass its information to the backup server’s storage daemon. You can check the status of the job using the “status” command as we did above. You should also check the messages using the “messages” command. If you continue to check messages, eventually you will receive a summary of the backup operation. It should contain the line “Termination: Backup OK” if everything went as expected.